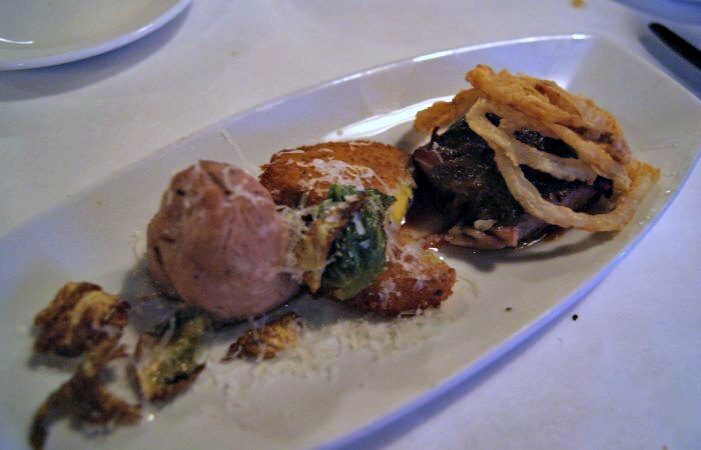 A month or so back, we went to Moxie, a New American restaurant in Beachwood. It has a cool vibe that we noted upon walking in – open spaces, an assortment of art-type things, and an undercurrent of energy. The menu changes pretty regularly, and had a nice fall feel to it when we went. For starters, we tried a roasted red pepper soup and a platter of veal, short ribs, fried green tomatoes, and french-fried onions, both specials of the day. 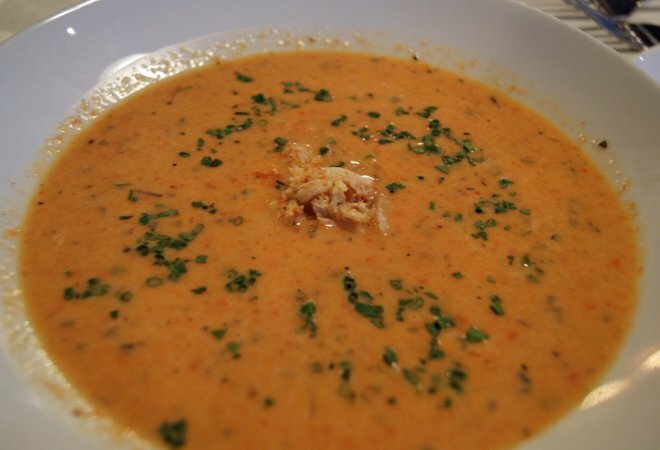 The soup was creamy and full of roasted red pepper goodness, and the meats were all delectable. 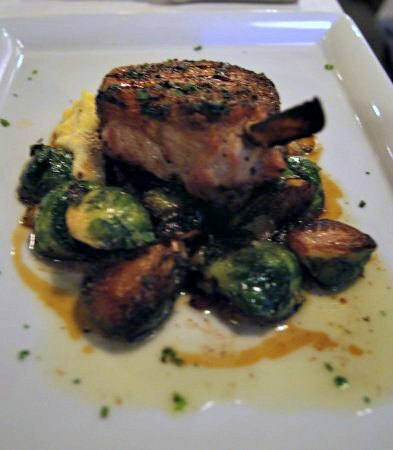 For entrees, S went with a bourbon maple pork chop, complete with Brussels sprouts, polenta, and prosciutto. I tried the duck confit, which came atop roasted apples, frisee (fancy greens), pomegranate seeds, and toasted hazelnuts. 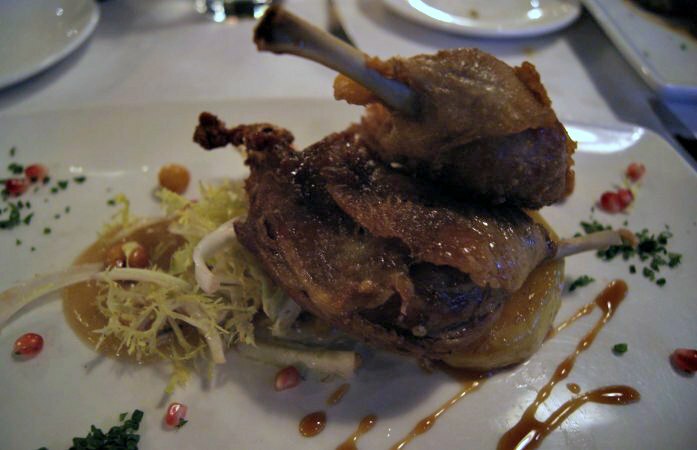 The duck was very good, but I could have used a little more substance to go with it. The apple was just a single fat slice, and the frisee, as greens are wont to be, was pretty light and boring. 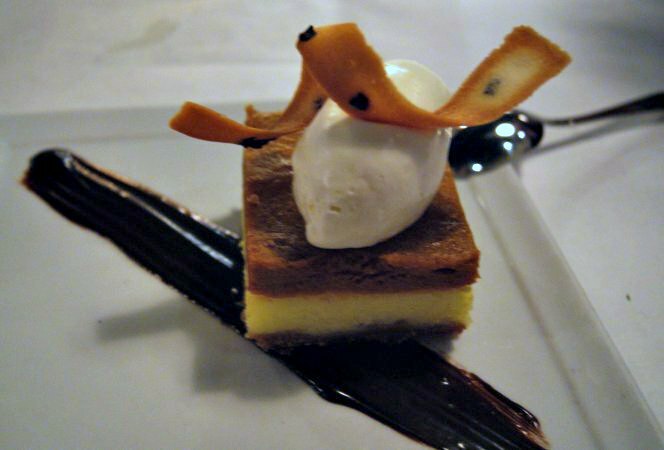 For dessert, we stuck with the seasonal theme and sampled the pumpkin torte, with cream cheese and whiskey chocolate sauce. Quite scrumptious. Verdict: Moxie gets 5 out of 7 stars. The food was mostly pretty excellent, the prices are okay, though slightly higher than comparable places we’ve been to, and the service was fine with one exception – I felt like we were gently being pressured into upping our order. For example, we always split apps and desserts, and each time we ordered something, he asked if we wanted two, even after we had said we were splitting. Not a big deal, and he wasn’t pushy about it, just nothing we’ve gotten anywhere else. If I want two, I’ll order two. Aside from that, a pleasant dining experience!